Winter is finally here and so is the holiday season. Christmas will be here in a blink and it will be followed by the New Year’s Eve. We all like a little get away from our jobs and daily routines during this time of the year. And we all like to go to a luxurious hotel and just relax. But what makes a hotel room luxurious? What makes us feel like we belong there? Yes, the feeling of comfort! Imagine as a guest walking into your hotel room, feeling really cold and tired because of the long journey and a very tiring year, and seeing a cozy blanket that can bundle you up and warm you in a few seconds –not only with its texture but also with its aura and atmosphere. What about after the arrival? What would we do after a long and cold day? –Probably a hot shower! And what would complete a perfect, relaxing shower? –Yes! A cozy bathrobe that you can spend long hours wearing. Spas, saunas, and swimming pools are inseparable parts of hotel holidays. You can make your guests’ experiences even better by giving them the ultimate luxury and exclusive service they deserve. That’s why our peshtemals and hammam towels are perfect for you because they will provide the absolute quality you are looking for. 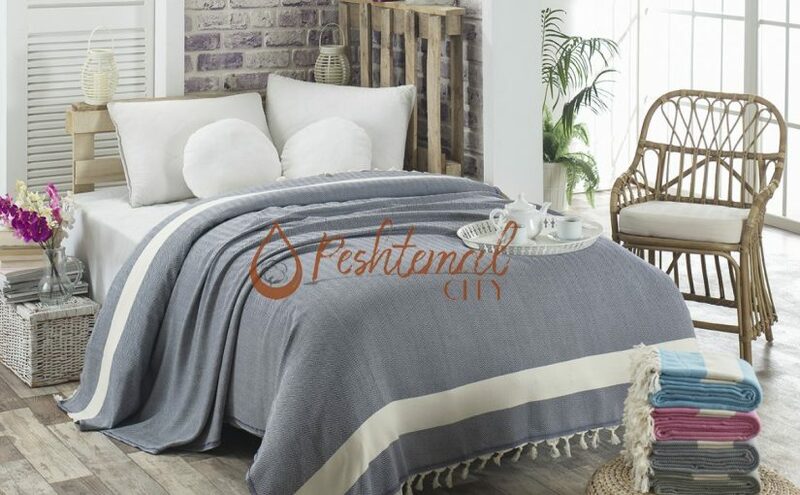 We, as Peshtemal City, offer you the perfect full packages. Let’s take a look at our Christmas 2018 Special! The first item we are looking at is Ocean Peshtemal. 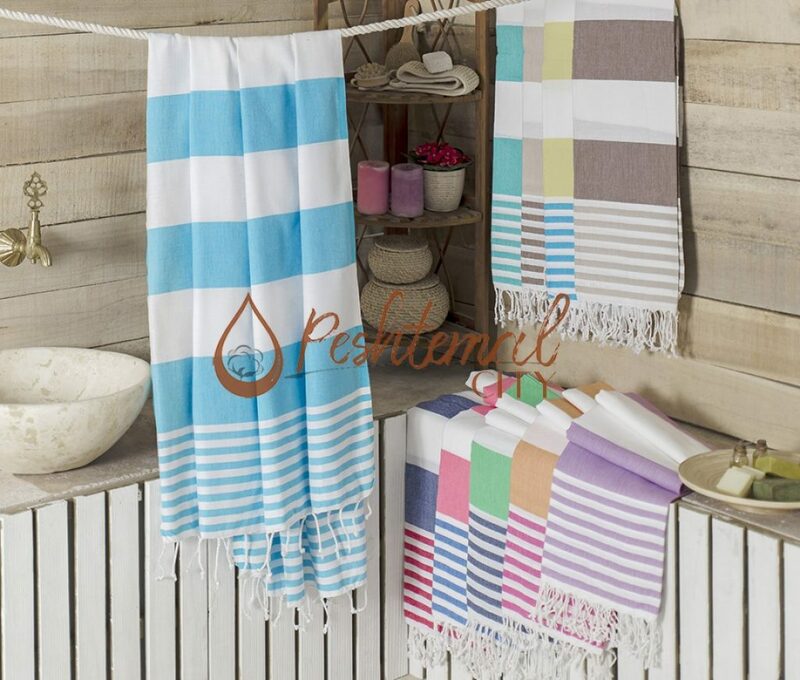 It is one of our top selling Turkish towels for the holiday season with its comfortable texture and colorful design. Ocean Peshtemal is woven 100% from premium quality Turkish cotton. 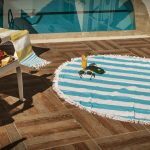 Ocean Peshtemal will be perfect to use in your hotel bathrooms, spas and swimming pools. We offer a wide color spectrum for this hammam towel, all of which will be perfect for Christmas spirit. Rich colors and soft, quality texture of our peshtemal will turn any holiday unforgettable. Ocean Bathrobe will provide your guests the perfect comfort with its soft nature. We again offer a wide and rich color spectrum that is magnificent for Christmas –vivid reds and greens or any other color that pleases you. Ocean Bathrobe is simple and elegant, giving you a relaxed feeling, reminding you of the ocean and the sounds of the waves. It will, for sure, give your guests the best experience ever. Our last product, Ocean Blanket, is also woven from %100 premium quality Turkish cotton. 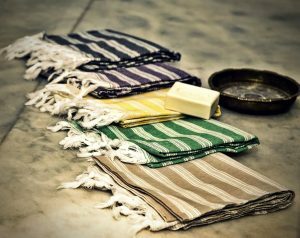 It is soft and light like all hammam towels, peshtemals, and bathrobes we manufacture & wholesale. Yes, it is soft and light. But, it can keep you even warmer than the other heavy types of blankets. It matches our Christmas Package perfectly, with its vivid Christmas colors and soft, quality texture. Ocean Blanket will surely turn your guest’s adventures in your hotel much more memorable and their sleep much more comfortable and soothing. We again offer you a wide color spectrum, starting from red and green which are perfect for Christmas season, and ending in pink, blue, orange and many more. We can modify these products in any color or pattern per your request! Don’t forget that we’ll be happy to answer any questions you have about the peshtemals, hammam towels, blankets, and bathrobes we manufacture & wholesale! You can easily contact us via our “contact us” page for any questions or Turkish towels wholsale enquiries and we will respond to you as soon as possible. You can discover our entire collection on our “products” page easily. Happy Customers Bring More Customers! Comfortable rooms are the most important thing for hotels to keep their customers happy. Yet, it’s not the only thing! Your hotel rooms also MUST be appealing to your customers. Dream yourself traveling around the world. You’ve arrived to the city you’ve always wanted to visit. You are going to your hotel to settle in for your trip. You check in and go to your hotel room. And you find your room to be cute and comfortable. Your holiday starts in a cheerful way now. Right? 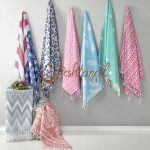 As a manufacturer & wholesaler of traditional hammam towels, peshtemals, bathrobes, and blankets we will tell you the easy way to enhance chic and comfortable hotel rooms. Simply go to our “products” page and find our lovely Diamond Peshtemal, Diamond Blanket, and Diamond Bathrobe! These 3 products will enhance the looks and the comfort of your hotel rooms and satisfy your customers during their trips. Let’s find out why our magnificent trio is perfect for you! First item in our Winter’18 Diamond Set is Diamond Peshtemal. Diamond Hammam Towel will be an elegant addition to your hotel bathrooms. Its absorbent & quick-drying texture will keep your customers dry & happy after a relaxing swimming session. Your customers will also enjoy using Diamond Peshtemal in your hotel’s spa or hammam. 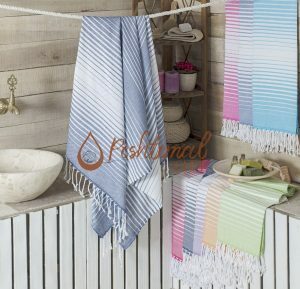 Diamond Peshtemal is one of our traditional hammam towel designs. It has flawless diamond shapes on its texture and fringes swinging on both ends. With its elegant and eye-catching design, Diamond Peshtemal will enhance the looks and the comfort of your hotel! 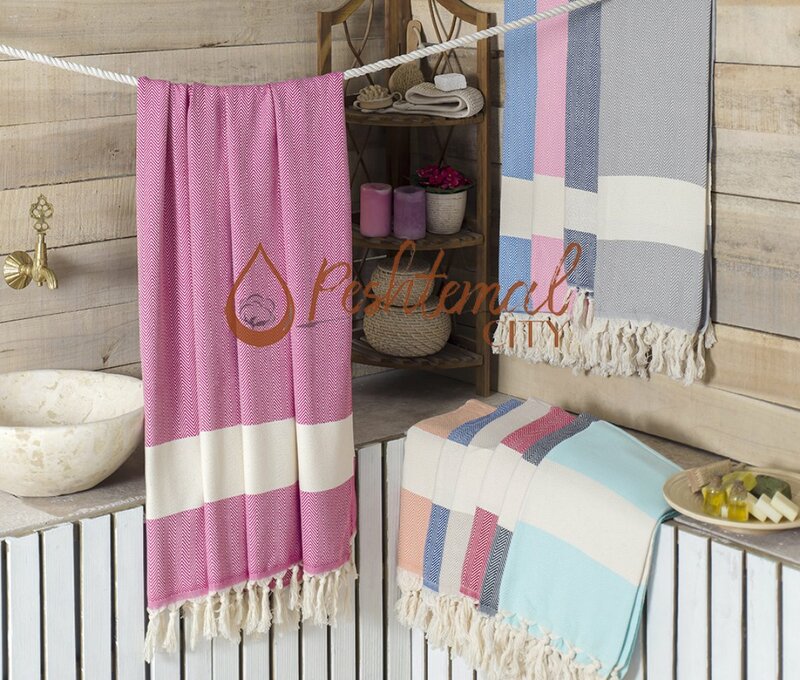 You can learn more about one of our top-selling traditional hammam towel designs, on Diamond Peshtemal product page. There are flawless diamond shapes on the colorful texture of Diamond Bathrobe. Think that your visitors have spent their day doing sightseeing, had fun swimming, or relaxed at spa. It is now night time. They had an excellent dinner. And they are now heading to their hotel room. What will they do? They’ll probably take a shower and sleep right away. However, if you manage to keep your customers comfy after the shower, they will keep spending more time awake! I hear you saying “Ok, what will happen when they’re awake??”. Let’s find out. Diamond Bathrobe’s light-weight & soft texture offers the best experience to your customers after a relaxing bath at the end of their day. We guarantee that it will make your customers cozy & happy. And happy customers will spend more time, and therefore spend more money in your hotel! You can learn more about one of our most comfortable bathrobe designs on Diamond Bathrobe product page! 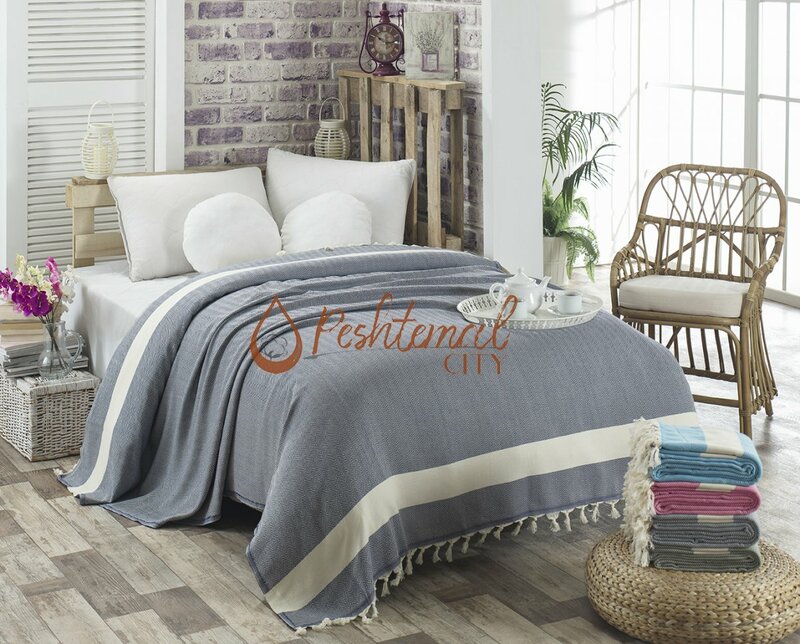 Woven 100% from special Turkish cotton, Diamond Blanket has an extremely light-weight and thin texture just like all of the hammam towels, peshtemals, and bathrobes we manufacture & wholesale. But don’t be deceived by it being light-weight and thin! It will keep your customers warm and satisfied during the cold winter nights! It suits the perfect trio with the flawless diamond shapes and colorful & white blocks all along its texture. The snow-white fringes swinging at the both ends of Diamond Blanket makes it a unique and different blanket. With its comfortable texture and elegant design, Diamond Blanket completes our magnificent trio. You can learn more about the last piece of our Winter’18 Set on Diamond Blanket product page! Before we finish our article, we want to inform you about our Winter’18 trio! We offer a wide color spectrum for all three products, Diamond Peshtemal, Diamond Bathrobe, and Diamond Blanket. You can choose the perfect combination of colors that suits your hotel rooms from our wide color spectrum. All three products are extremely durable! You can use the set for a long time before needing to replace them. You’ll save money & time if you choose our products. Lastly, yes! We can modify these products per your request! Don’t forget that we’ll be happy to answer any questions you have about the peshtemals, hammam towels, blankets, and bathrobes we manufacture & wholesale! You can easily contact us via our “contact us” page and we will respond to you as soon as possible. 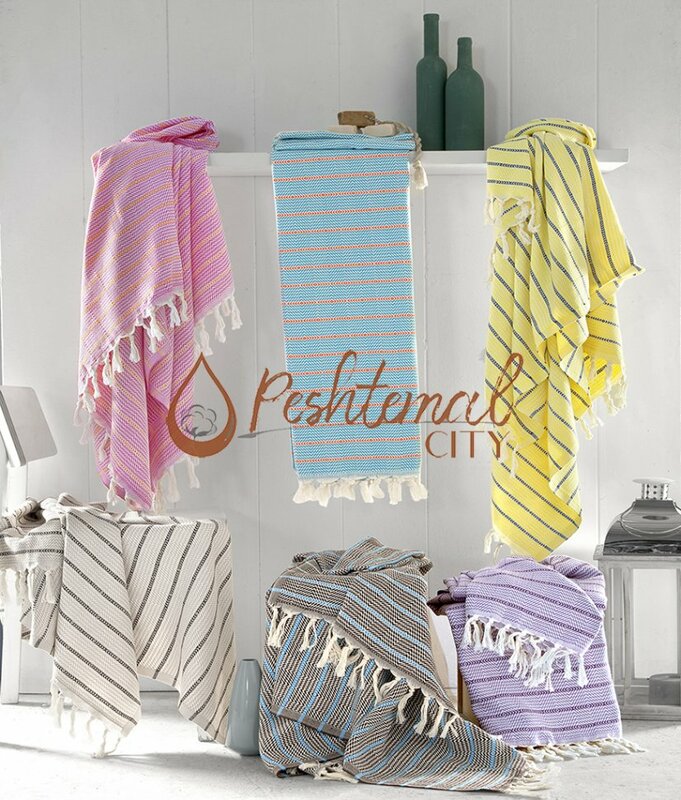 Peshtemal City, peshtemal manufacturer wishes you a warm winter in 2018! This week’s article will be a continuation of our peshtemal reviews. For this week, we picked three of our top-selling, premium quality traditional hammam towel designs: Sultan, Ares, and Diamond. All three of our traditional hammam towels are woven 100% from premium quality, ring spun Turkish cotton yarns and dyed by the best dye-house in Denizli/TURKEY. Thus, they don’t contain any allergic materials on their texture. Sultan, Ares and Diamond Towels are elegant and premium quality alternatives to dull, ordinary and harsh terry towels! 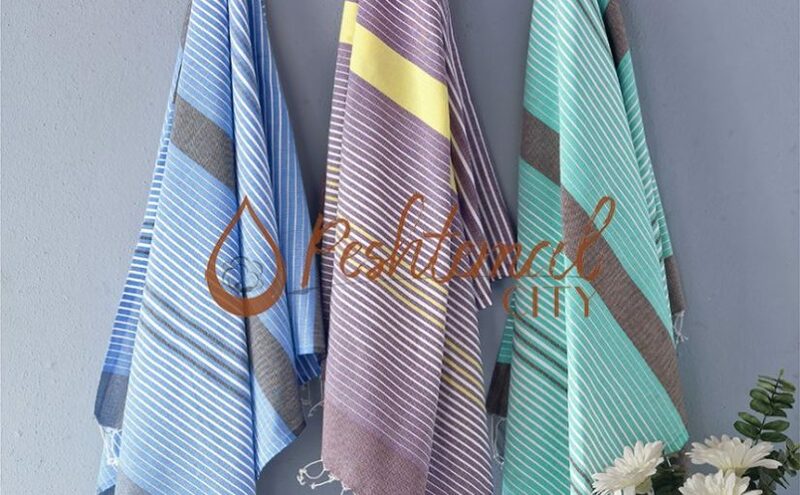 Before we begin reviewing three of our most desired Turkish Towel designs we suggest you visit our “What is Peshtemal?” page for a detailed information on the cultural and historical aspects of peshtemals! Sultan Peshtemal is highly absorbent, quick-drying, soft and durable. With a size of 100×180 centimeters and a weight of just 260 grams, It has an easy-to-pack nature. It has thin, white stripes and single-colored blocks along its texture completed with white fringes at the ends. In short, It is a chic traditional hammam towel design. As always, we offer a wide color spectrum for Sultan Towel for our customers to pick the perfect hammam towel to decorate their homes as desired, or to create a stylish combination with their beachwear during their vacations! With its captivating design, and premium quality texture, Sultan is one of our most desired designs. It is also one of the top-selling products in the entire market! Its premium quality combined with its chic design makes it perfect both for vacations and for home decoration! To learn more about one of our most desired designs visit Sultan Peshtemal product page! Ares Towel is named after one of the twelve Olympians, the Greek god of war. Qualifying to its name, Ares Turkish Towel is highly absorbent, quick drying, soft, and extremely durable, thus it is one of our most desired hammam towel designs! It has white, and single-colored blocks completing each other along its texture and thick, white fringes at the ends. Our customers can pick the color they desire from the wide color spectrum we offer for Ares design! To learn more about one of our most durable designs visit Ares Peshtemal product page! Both strong and brilliant like a perfect diamond, Diamond Design is one of our luxurious hammam towel designs. It has small diamond shapes embellished with a thick, white block near the edges and soft fringes at both ends. We also offer a wide color spectrum for Diamond hammam towel for our customers to choose the perfect hammam towel to decorate their bathrooms and kitchen or to create a stylish combination with their beachwear during their vacations. Diamond Turkish Towel is highly absorbent, soft, durable, and quick-drying. With a weight of just 430 grams, it is slightly heavier compared to our other products, yet lighter than ordinary terry towels! To learn more about one of our luxurious designs visit Diamond Peshtemal product page! We hope that our reviews are comprehensive and helpful enough for our respectable customers. Before we finish, we suggest you to visit our “products” page for more luxurious hammam towel designs! Also be sure to check our “contact” page for any questions or for your wholesale needs! Follow our “blog” for more peshtemal reviews! We wish everybody a relaxing and fun Summer 2018! 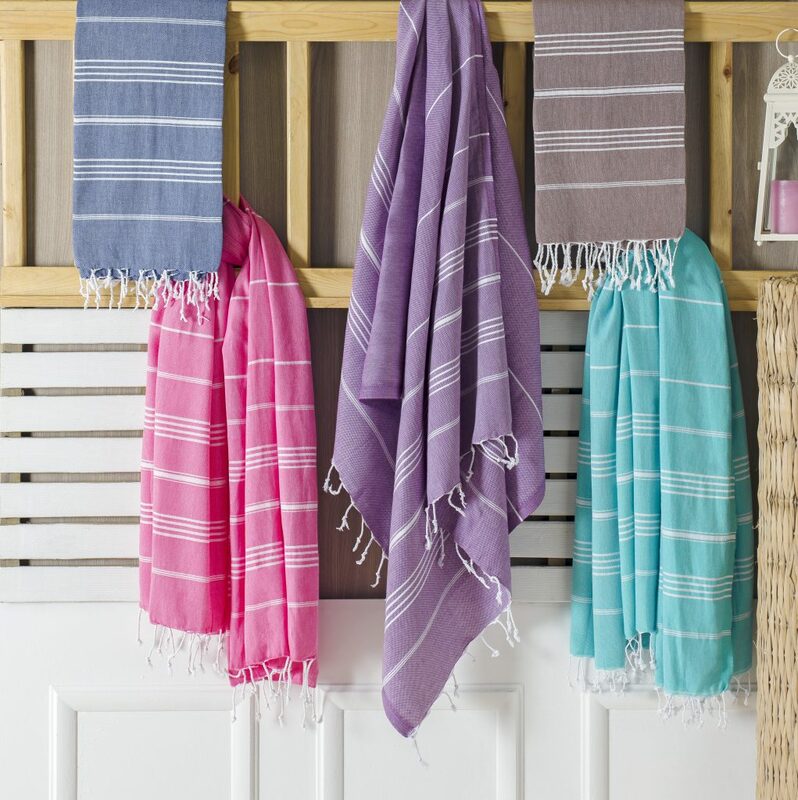 After a short break on our weekly updated peshtemal, Turkish towel, hammam towel, and fouta towel blog, we return with our traditional peshtemal reviews. 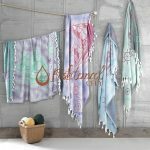 This week we have picked two of our most colorful designs: Rainbow Peshtemal, and Blossom Turkish towel, and one of our most elegant, high-quality traditional designs: Saraylı Hammam Towel. Blossom Turkish towel, is woven 100% from high quality cotton and dyed by the best dye-house in Denizli/TURKEY. It already became one of our top selling products in a short amount of time. We are proud that our product breathe life into our customers’ bathrooms, and enliven the sandy beaches. Blossom Turkish towel is one of our latest fashion Turkish towel designs. It has colorful blocks on its texture. It comes in a variety of color options for you to choose the perfect Turkish towel to combine with your beach wear, or enliven your home! It only weighs 300 grams and has a size of 100×180 centimeters. 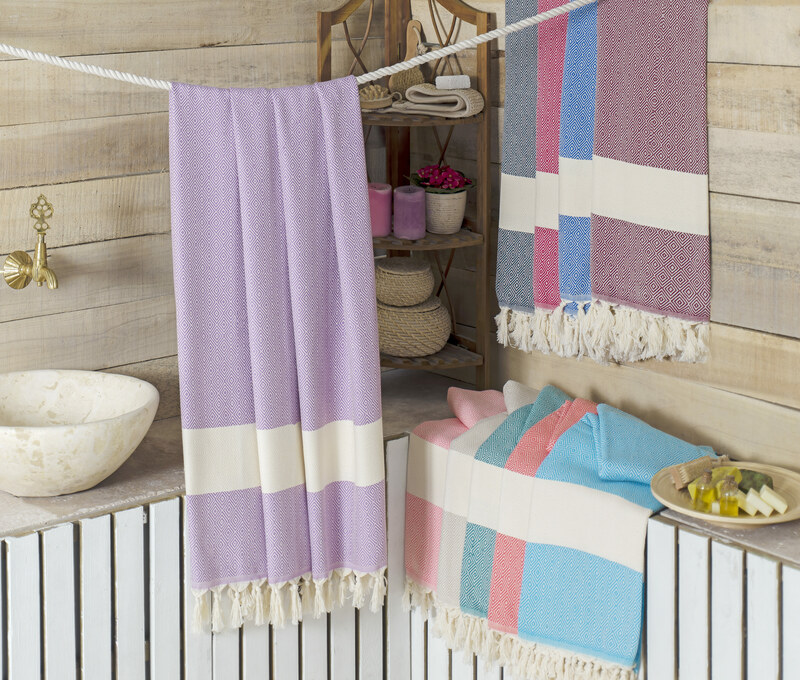 Blossom Turkish Towel is soft, highly absorbent, quick-drying and durable by its nature. 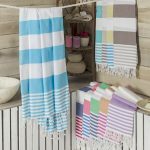 To learn more about one of our top selling Turkish towel designs visit Blossom Turkish Towel Product Page by clicking here! One of our older designs, Rainbow Peshtemal is also woven 100% from high quality cotton and dyed by the best dye-house in Denizli/TURKEY. Even though it is one of our older designs, it is still high in demand due to its high quality texture. Rainbow Peshtemal weighs 260 grams. In despite of its light-weight texture, Rainbow Peshtemal is highly absorbent, soft and quick-drying. With a size of 100×180 centimeters, and such a light-weight texture, Rainbow Peshtemal is easy-to-pack, which makes it perfect for your travels. 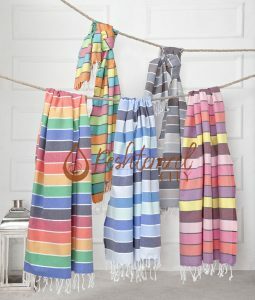 Rainbow Peshtemal has a combination of thick, and thin, colorful stripes on its design. 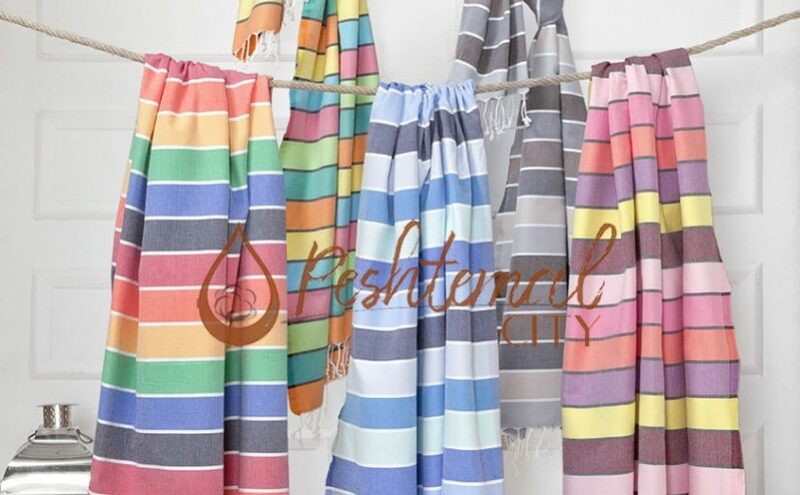 We offer a wide color spectrum for this product for our customers to choose the perfect peshtemal to use at beaches, hotels, spas, beaches etc. 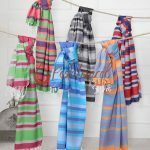 To learn more about one of our high quality, and colorful peshtemal designs visit Rainbow Peshtemal product page by clicking here! Peshtemals, also known as hammam towels, are a very important tradition that has been carried from the Ottoman Empire to the modern-day. Saraylı Hammam Towel is our signature product and the indicator of our respect. Saraylı Hammam Towel has a traditional, stripped design with fringes swinging on both ends. It is one of our most elegant and eye-catching products. Saraylı Hammam Towel weighs only 200 grams. With such a light texture and with such an elegant design, it is perfect for you to take them to spas, hammams, yachts, beaches, or gyms. Saraylı Hammam Towel is also a perfect decorative item for your bathrooms. To learn more about one of our traditional hammam towel designs visit Saraylı Hammam Towel product page by clicking here! Visit our “products” page for more detailed information on our high quality peshtemal designs. We suggest you also visit our “What is Peshtemal?” page for more information on historical and cultural importance of peshtemals. Visit our “contact” page for any questions or your peshtemal wholesale needs! We have been posting reviews of the hammam towels, we manufacture and wholesale for our customers. As a continuation of our reviews, this week, we will be reviewing three different hammam towels for you; Marine Peshtemal, Nazar Hammam Towel, and Chilly Turkish Towel for this week’s blog post. Before beginning, we wish everybody a fun and relaxing summer season this year! Woven 100% from high-quality cotton, Marine Peshtemal weighs only 260 grams and it has a size of 100×180 centimeters. Even though it has a light-weight texture, Marine Peshtemal is highly absorbent and quick drying. Marine Peshtemal is also easy to pack, which makes it perfect for you to take it with you to your vacations. Marine Peshtemal is one of our most fashionable products. It carries the traditional aspects of hammam towels with its striped design, and fringes swinging on both ends. However, with its multi-colored texture, it has a vibrant and modern look. Being both old school and modern at the same time, Marine Peshtemal is perfect for you to make a stylish combination of your dressing. Also woven from 100% from high-quality cotton, with a weight of 430 grams, Nazar Hammam Towel is a little bit heavier than Marine Peshtemal, yet still lighter than ordinary towels. Soft, highly absorbent, quick drying, light-weight, and easy to pack; Nazar Hammam Towel is both perfect for you to take it with you to your vacations and for you to use at home. Dyed by the best dye-house in Denizli, Nazar Hammam Towel doesn’t contain any harmful materials on it; so, can be confidently used. Our designers worked hard on this eye-catching piece since we have designed it as a sign of our respect to the historical and cultural values of hammam towels. Carrying all the traditional aspects of Turkish towels, Nazar Hammam towel is one of the most elegant hammam towels that we manufacture. To understand why we are proud of this product so much, we suggest you visit our blog and read our previous posts about the history of peshtemals. 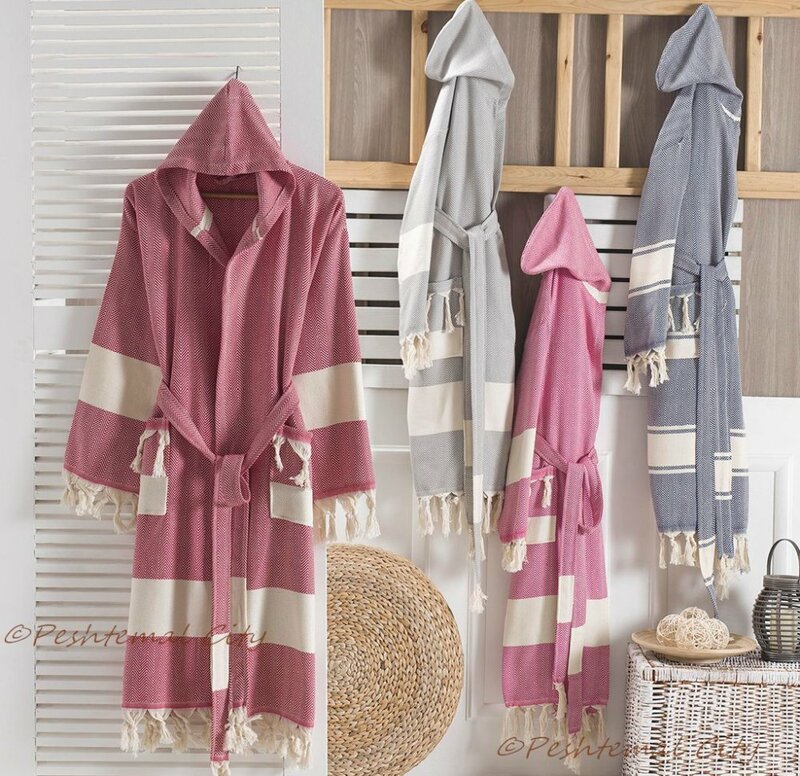 Chilly Turkish Towel has a size of 100×180 centimeters and weighs 300 grams. It is woven 100% from high-quality cotton and dyed by the best dye-house in Denizli; thus it doesn’t contain any harmful materials. It is highly absorbent quick drying, soft, and extremely durable. 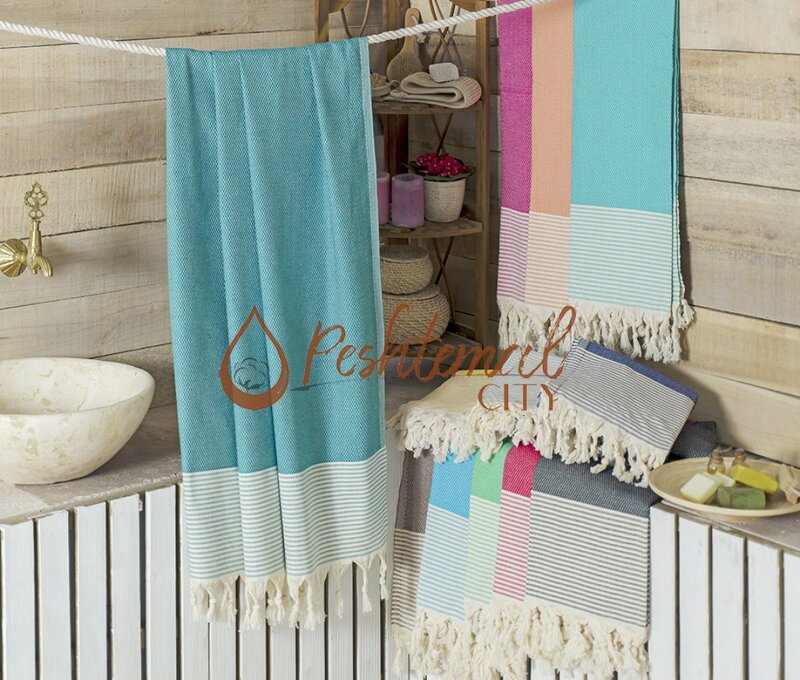 With its soft texture and colorful patterns on it, Chilly Turkish Towel has a cuddlesome design. Being both high quality and cute, it can be confidently used for baby-care. It would also make a lively decorative item in your bathroom, kitchen, or at your yacht. Be sure to visit our website to learn more about our products that we wholesale to many countries all around the World, such as Canada, USA, Netherlands, Germany, Australia, United Kingdom etc. You can get our contact information in our website.